What does it mean to be Fearless Leadership team? Why does that matter? And how do we build a Fearless Leadership team? Which of these challenges do you recognise in your leadership team? This White Paper addresses these challenges and more. I hope it stimulates some interesting thinking about what’s happening now within your leadership team, and what could be possible. 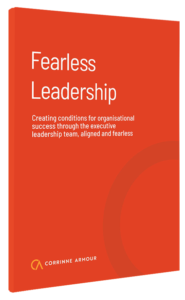 Download the White Paper ‘Fearless Leadership: Creating conditions for organisational success through the executive leadership team, aligned and fearless’.